Last night I pushed a big upgrade to GetCredo.com, and Credo Pro as well. 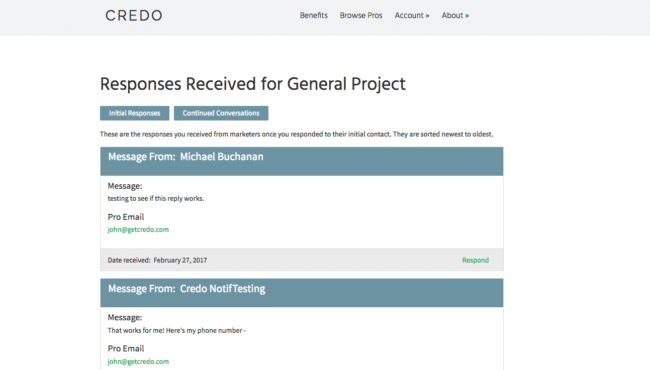 Here’s what’s new on Credo. If you’ve been following me on Twitter, Instagram, or if we’re friends on Facebook then you’ve seen a lot of this teased. One of the things I am most excited about is the new homepage + conversion flow combination. While that’s a big inside-baseball-y, I am very excited about the new homepage because it finally communicates what Credo is all about. 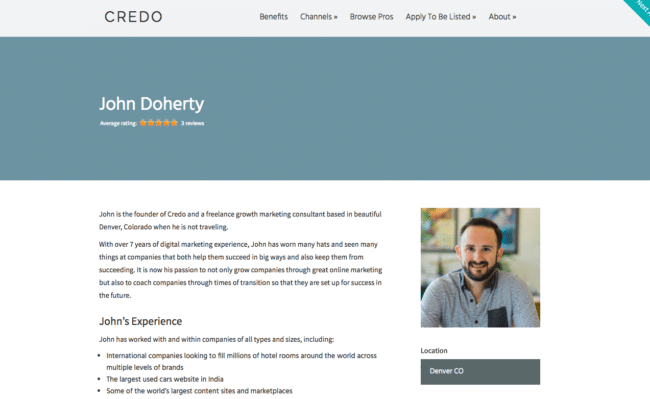 I worked with Joel Klettke at Business Casual Copywriting to put together a homepage that communicates what Credo is all about, without using a ton of text. The old homepage was quite text-heavy and wasn’t quite sure who it was speaking to. 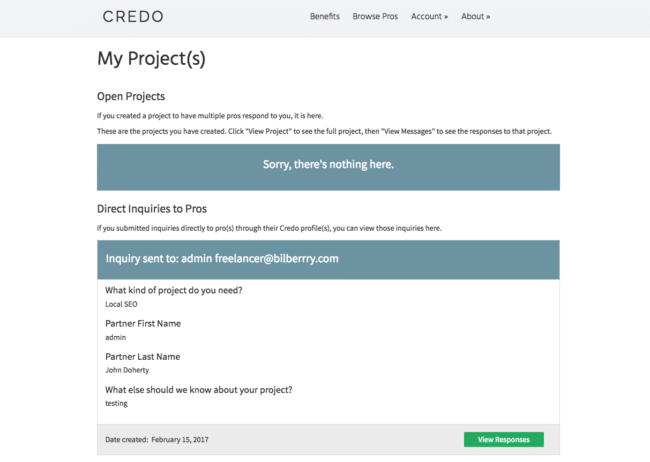 The new homepage, which has a lot of new elements as well as a new cleaner look, communicates who Credo is for (businesses looking to hire). I’m no longer trying to serve two masters and speak to both these businesses and marketing agencies/consultants. One of the biggest things I have been asked for both by agencies as well as businesses looking to hire is case studies. 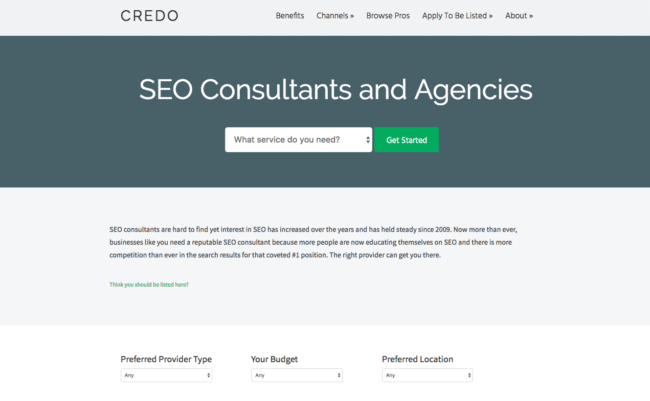 Credo provides a lot of information around the types of services an agency offers as well as the types of businesses and business verticals in which they’ve worked. As of today, agencies and consultants can also upload PDF versions of case studies of work completed. These appear underneath the contact form on profile pages and open in a new tab. I’m excited to see what agencies choose to show off! This feature is still a bit rough looking, and will be cleaned up over time! To go with the new homepage, I’ve also reskinned the top of category and profile pages, cleaned up the CSS on a lot of the deeper category pages, and made a new menu/footer color scheme in an attempt to lighten up the site. 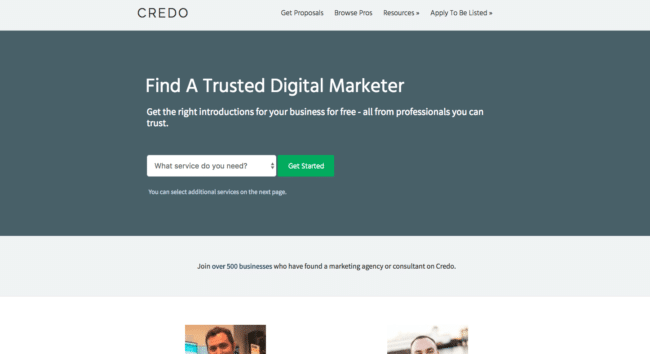 To be honest, I did a lot of competitor analysis while creating this new version and realized that Credo was very dark compared to competitors. While standing out can be a good thing, this was not one of those cases. hasn’t worked for a number of reasons. First, I get no visibility into if a project may or may not even close and therefore I or someone on my team can’t step in to help. Second, email is unreliable. 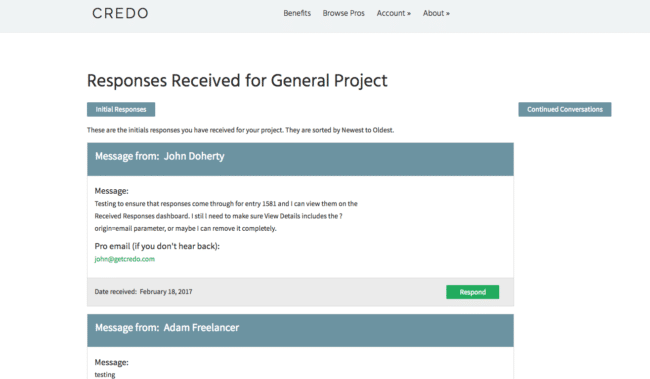 We actually had some deliverability issues for a few months which significantly impacted the business. I want to reduce those dependencies. With every release should come a lot of bug fixes as well as new features. While I hate to admit it, I ship just as many bugs as anyone else and we’ve probably introduced a few in this version! A lot of hard work and time and frustration has gone into this release. I’d love to hear your feedback!